What: A 30th Anniversary party / fundraiser / MTB photo contest. This is an ALL AGES event. Scroll down for contest entry details. Cold Beer from Chainline Brewing Company — $5 dollars for a pint that goes straight back into the trails! Food available for purchase from Tacos El Guero. Evergreen Crank Sisters will be accepting donations of any gently used gear and ride worthy clothing. The chance to vote for your favorite MTB photo. Raffle drawings and a retro biking costume contest with killer prizes. A general sense of merriment from hanging out with awesome people! 6:30 pm: Doors Open at Gerks Ski and Cycle. 6:30 – 8 pm: Photo contest voting, cold beer, and trail talk. Funny. Thoughtful. Arty. Adrenaline soaked. Or just plain cool. When it comes to subject matter and style, pretty much anything goes as long as it’s mountain biking related, shot in Washington, and legal. This year, in honor of Evergreen's 30th anniversary, there will be two categories, one for present-day entries and one for classic shots. We want to see all those great shots from the days of bar ends, toe clips and heavy lycra up to modern times. Prizes for 1st, 2nd and 3rd place winners in both photo categories. Make sure to not wait until the last minute to turn in your photos. Please note, unlike last year, we will not be having a video contest, but will be playing some classic videos during the event. 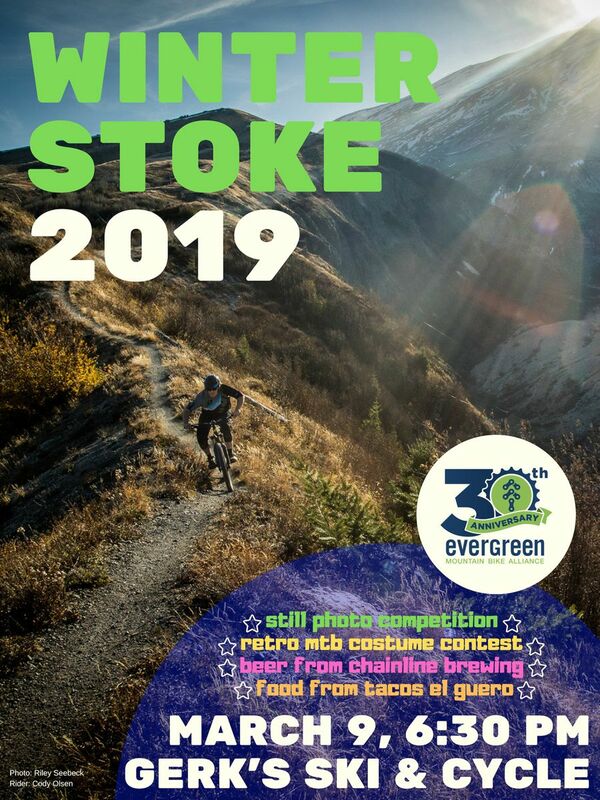 Final framed photo submissions due to the Evergreen office or Gerk's Ski & Cycle by March 8th, 2019. Framed photo entries must also be submitted the week of the event. Pretty much anything goes as long as it's mountain biking related, shot in Washington, suitable for all ages, and legal. You'll get free admission to the party too with your photo submission! The winning photos will get sweet prizes and be featured on our Instagram and Facebook Channels! Are you interested in helping out at this year's Winter Stoke? Check out our Sign Up page for lots of ways to get involved!